It's often necessary to include data from a record's related lists in your documents. In the template editor, S-Docs includes a powerful, easy-to-use related list generator just for this purpose. For example, if you have a template from an opportunity, you can insert a related list that will display certain fields from an opportunity's child quote records. The S-Docs related list generator provides a complete range of flexibility in developing templated related lists. For example, without even editing any code, you can adjust the formatting of the related list's table and columns, select any of the related list object's fields that you would like displayed in your table, and even filter/sort the related list rows by user-specified criteria. If you decide to go one step further and edit the related list source code, the possibilities for modification become endless. The document above was generated from a template for an opportunity. In this template, we inserted a related list for an opportunity’s child quote records. Now, let's begin! In the template editor for our opportunity template, we start by clicking the “Insert Related List” button at the top of the page. The following window will appear. Note the drop-down menu under “Step 1: Select a Related List”. 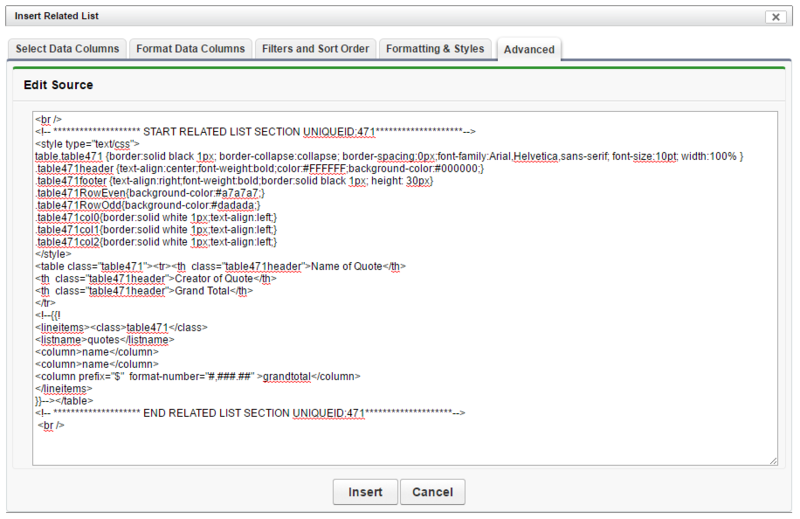 This drop-down menu allows you to select an available related list for your object. In this case, we selected the quotes related list for our opportunity. 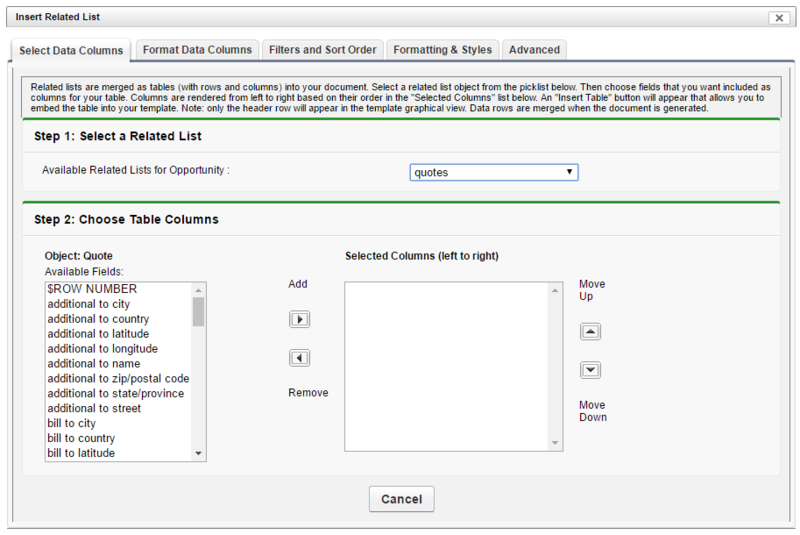 We then go to the “Available Fields” list under “Step 2: Choose Table Columns”. 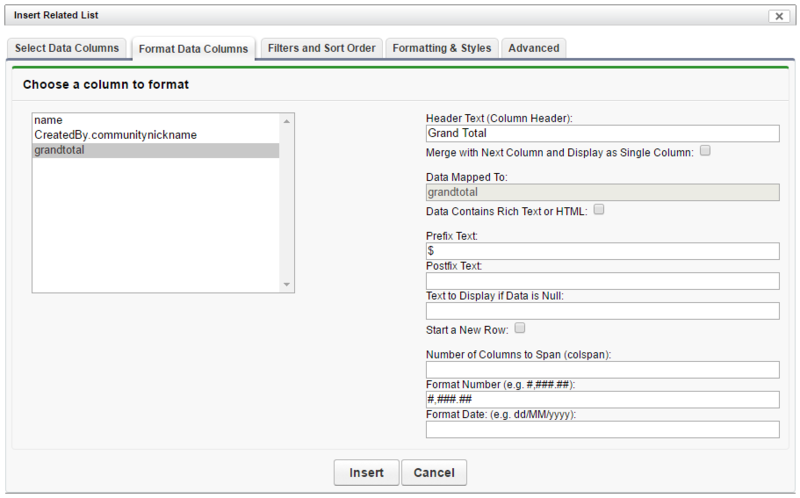 We can select some of these fields to be used as columns in the table that we are inserting. To add a field as a column in our table, click the name of that field and then click the button under “Add” (similarly, you can select a field in “Selected Columns” and click the button above “Remove” to remove that field from your table’s columns). We added two fields to our selected columns. 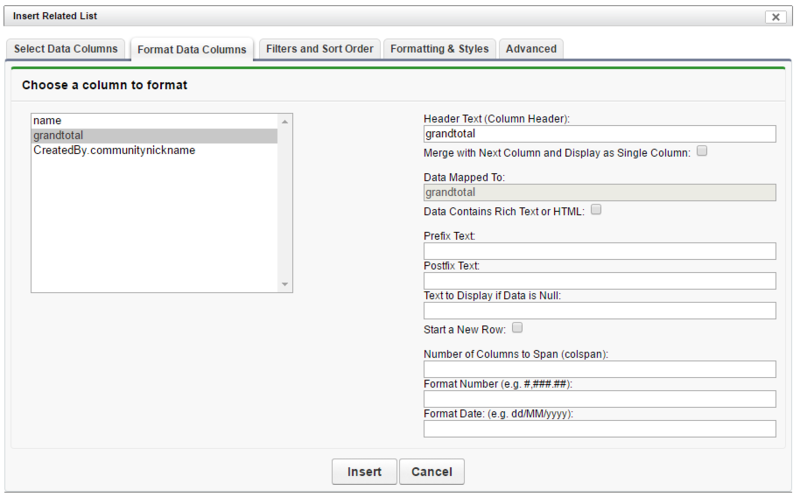 This will result in a “name” column and a “grand total” column for our table; when we generate a document for this opportunity, the name of each quote will be displayed under the “name” column, and the grand total of each quote will be displayed under the “grandtotal” column (we can edit the names of the columns later). Note that some of these fields have this character to the right of them: “>”. In our example, we see that two of these fields are “contact id >” and “created by id >”. These fields correspond to ID’s of object records in our related list; as such, we can pull data from these object records. 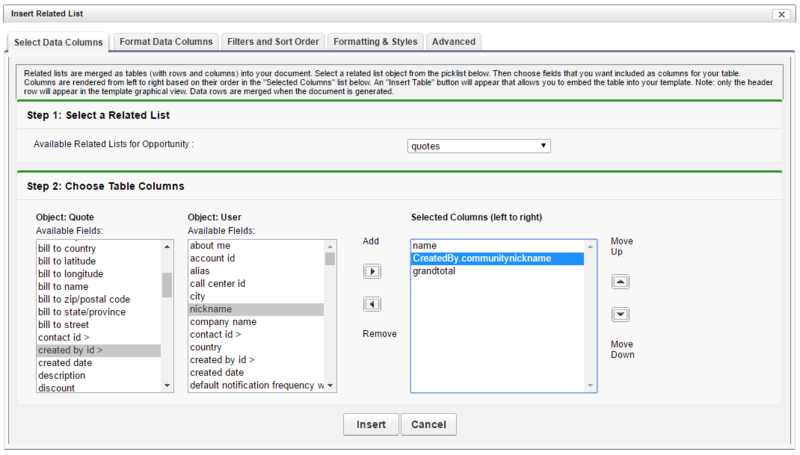 In the table in our example, we will include a column for the nickname of the user who created the quote. So, in our resulting table so far, we will have a column for the name of each quote related to the opportunity that we generate a document for, as well as columns for the grand total of each quote and the nickname of the user who created that quote. Note that we can change the order of our columns with the “Move Up” and “Move Down” controls. This will change the order of the columns as they appear in the final table from left to right (the uppermost column in the “Selected Columns” list will be leftmost in the resulting table). To move the nickname column to the left, we select CreatedBy.communitynickname and move it up. 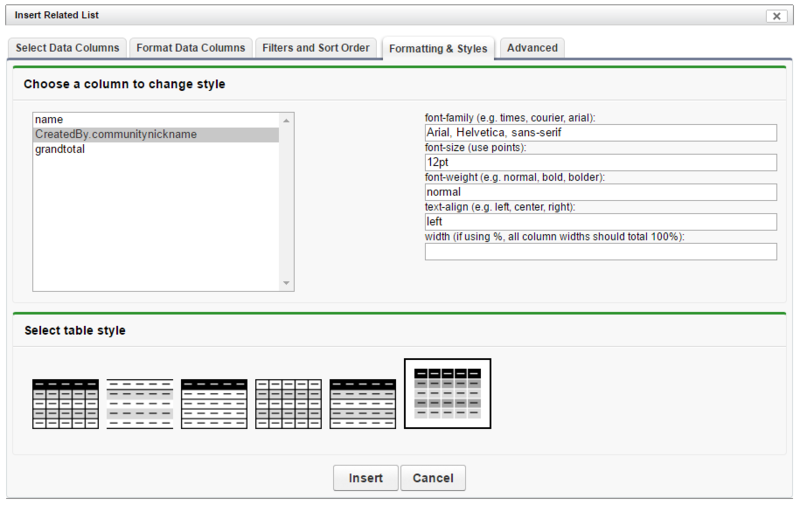 After selecting all the columns you’d like to have in your related list, open the “Format Data Columns” tab. Here, we can edit how each column will appear. By default, our columns will be named “name”, “communitynickname”, and “grandtotal”. We can change these names under “Header Text (Column Header)”. The other fields offer useful formatting options for each entry under the selected column. For the “grandtotal” column in our example, we set the prefix text to “$” and the format number to #,###.## so that grandtotal entries will be formatted as currency. 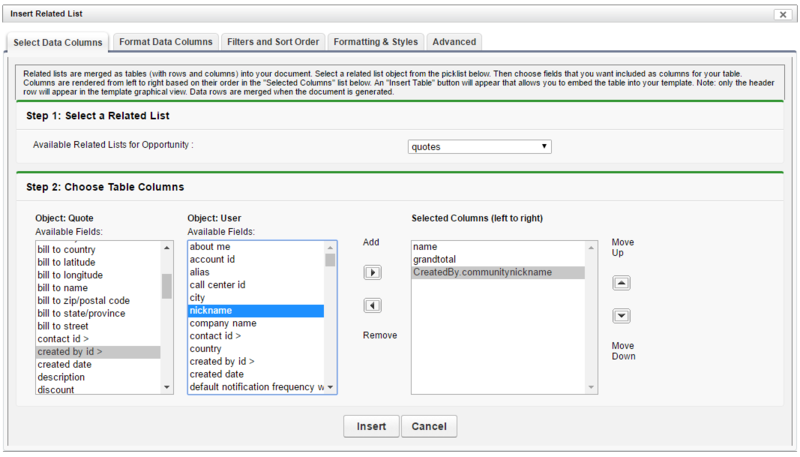 After formatting your columns, click “Formatting & Styles” to apply even more formatting to your table. We see that we can change the table style as a whole, as well as change the formatting of the text in each individual column. You can also use filter out rows and change the order in which the rows are sorted using SOQL and filter logic by accessing the “Filters and Sort Order” tab. Examples of filter logic are included under the description for each field in this tab: for example, using “CreatedDate = THIS_YEAR” in the first field would make our table comprised of quotes from this year; quotes related to our opportunity from other years would not be included. The other two fields allow us to limit the number of rows created in our table, and to sort our rows by filter logic or SOQL ORDER BY clauses. Click “Insert” to insert the table into your template. Note that we do not see any data or fields under our columns, as this is a template. The table will populate as expected upon document generation. 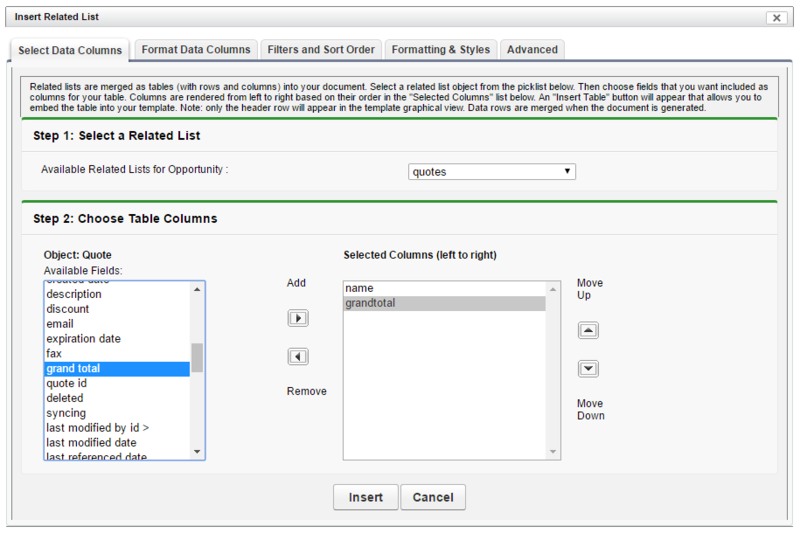 If you wish to edit your table after insertion (such as adding and deleting certain fields it uses as columns), you may edit it in the source editor. However, if you wish to edit it in the WYSIWYG editor, you will have to delete the table and create a new one using the “Insert Related List” button.